Born 1811 Death 1863. In the partnerships of S.M. Tabler & Co. c. 1850; Wm. E. Taber & Co. with Henry G. Taber c. 1852-1854 and W.E. Taber & Son with William E. Taber, Jr. in 1863. Silversmith and jeweler. Founded by Harry Heye Tammen as H.H. Tammen & Co. which became the H.H. Tammen Curio Co. in 1896. 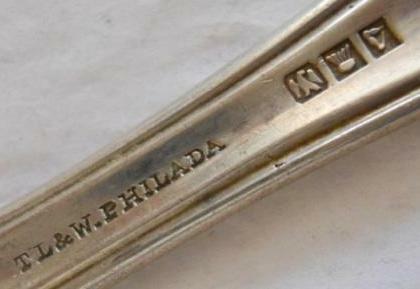 Succeeded by the Thrift Novelty Co. Makers of sterling souvenir spoons and novelties. Was in partnership with Oliver Blanchard Cooley in the firm of Tanner & Cooley 1840-1842. Born 1742 Death 1831. Married Sarah Holmes, the grand-niece of Benjamin Franklin. Tappan quit silversmithing around 1788 to go into the dry goods business. A partnership between William Star Taylor and Theodore M. Timms. A partnership between John Taylor, Horace Hinsdale, and Epaphras Hinsdale. Epaphras Hinsdale died in 1810. Robert H. Taylor and Robert D. Lawrie. The lower mark to the right is of an eagle/thistle/harp. Najah Taylor / N. Taylor & Co.
Involved in the partnerships of Wells, Taylor & Co. 1800-1807 and N. Taylor & Co. 1808-1816. Founded by emery W. Todd (a former Kalo Shop employee) and Clemencia C. Cosio. Cosio was the designer, Todd the silversmith. Makers of handwrought Arts & Crafts sterling flatware and hollow-ware. 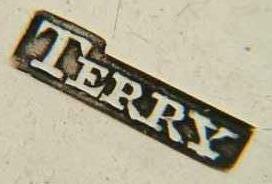 Was a partner with his brother Daniel Ingalls Tenney. Was in the partnership of H. Terlau & Co. 1866-1881. Partnered with Aaron Willard 1814-1815. In the partnership of Terry & Taylor with John Taylor c. 1820. 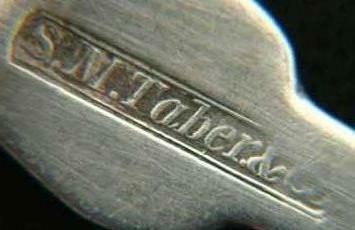 Makers of coin silver flatware and jewelry. Founded by father Charles Thomae and his two sons Charles G. Thomae and Herbert L. Thomae. Currently owned by grandson Charles F. Thomae. Makers of sterling holloware, novelties and baby items. The oldest marks are the crown/Old English T/lion.